CPCC’s very own Dr. Maha Gingrich will present the 11th annual “Dances of India” this spring. More than 30 dancers will perform a series of 3,000 year old traditional Indian temple dances that tell the story of ancient India through movement and music. 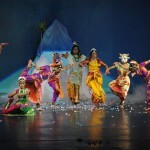 Performers will showcase the dances in colorful silk costumes with materials and scarfs from various regions of India. Come out and see the differences between traditional Indian dances, the Russian Gypsy, Flamenco, Chinese Long fan dance, Chile’s national dance and Peruvian scarf dances. This event will keep the history and heritage of this art form alive in the community and share the message of unity and diversity among Charlotte’s international community. In 2011 this event was named one of the top nine memorable events among the nation’s community colleges by Community College Week. “Dances of India” is an experience both you and your family will not want to miss! Watch this online video for a sneak peak! Tickets are $5 for school-age children and $10 for adults, and can be purchased online at tix.cpcc.edu or by calling the SunTrust Box Office at 704.330.6534. Free event parking is available. Click here to purchase tickets. DATE: Saturday, April 28; 4 p.m. LOCATION: Halton Theater, CPCC Central Campus. Indian snacks will be available for purchase during intermission.